AUSTIN (02 August 2016) – One of the rarest pieces of cultural and automotive history is being auctioned in London by the Austin Rock and Roll Car Museum on September 7, 2016, with a portion of the proceeds going to UNICEF in honor of John Lennon. 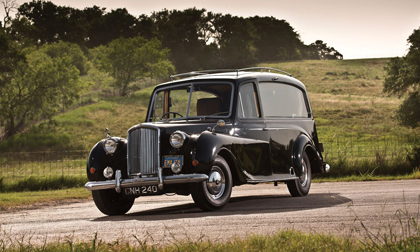 The 1956 Austin Princess was the personal property of Lennon and famously used by him and Yoko Ono in the 1972 film Imagine will auctioned by RM Sotheby’s along with the original title signed by the famous Beatle. Lennon’s Austin Princess has an unusual history. The car is prominently shown in the film, which was created to promote Lennon’s Capitol Records album that shared the same title. Austin Princess limousines were a popular mode of transport for The Beatles, and a number of them passed through the hands of Apple Records for use by the various band members. It is understood that the large rear door aperture made quick access to the vehicle an easy undertaking; a quality much appreciated when being chased by hundreds of adoring fans. The Princess is in survivor condition. With original paint and minor restorations, is mechanically sound and can be driven. The car is still fitted with the five airplane seats in the back that Lennon added to the Austin. It comes with the original vehicle registration/title document, signed by Lennon when he purchased it on 26 August, 1971, which, is in itself, is an important historical artifact. The upcoming sale of the car, which was donated to the Austin Rock and Roll Car Museum in Texas in 2008, is a once in a lifetime opportunity for any serious collector of Beatles or music industry memorabilia. A portion of proceeds from its auction will be donated to UNICEF, which is dedicated to improving the lives of children worldwide and was a favorite charity of Lennon. Other charities set to benefit from its sale include Make A Wish America and Dell Children’s Medical Center. Based in Austin, Texas, the museum celebrates great cultural icons. Vehicles in the collection range from race cars that competed at Indianapolis to customs, hot rods and limousines that transported the famous, each tells a story. Musical displays include custom guitars and other instruments. RM Sotheby’s evening London sale will be held at the stunning Battersea Evolution in central London on 7 September. The RM sale is the official auction of the Concours of Elegance at Windsor Castle. For further information on the car or the London sale, please visit www.rmsothebys.com. A non-profit entity, the AR&RCM collection includes several iconic and historically notable vehicles. The Museum shares space in a venue where other private collections are housed providing the public with a rare peek into an eclectic display of unique mementos and memorabilia including miniature vehicles, iconic neon signs and whimsical items that capture the imagination of children of all ages. Located in Austin, Texas, the Austin Rock & Roll Car Museum is housed alongside some of the hottest motorcycles, cars, and trucks ever seen under one roof. Dozens of one-of-a-kind Hot Rods, Choppers and 4x4s are on display in this classic “garage-style” venue. It is open to the public the First and Third Saturday of every month. For further information, visit www.austincarmuseum.org or call Olga Campos at (512) 710-6055.